Tonight’s matchup between the Atlanta Hawks and the New York Knicks marks the second time the two has faced off this week. It is very difficult to defeat the same opponent twice in the same week, and this proved true tonight, with the Hawks winning 110-90. The Hawks had a balanced attack, with eight players in double figures scoring. The game was close through the first quarter, the Knicks did not shoot well all night, but scrapped to get the offensive rebounds. The Knicks had six offensive rebounds, for eleven second chance points, in the first quarter. The rebounding edge gave the Knicks a 26-24 lead at the end of the first quarter. The Hawks were content on settling for three points shots early in the game, finishing the first quarter with ten attempts. The Hawks left a lot points off the board, missing wide open threes, especially Kyle Korver, who missed three straight before making one at 4:06 in the first quarter. This three kept Kyle Korver’s streak alive for consecutive games with a made three, pushing it up to 83 games straight. The tides turned in the second quarter, the Hawks second unit destroyed the Knicks second unit to start the quarter. Without Carmelo Anthony the Knicks were inept on offense, scoring only three points in four minutes. During this span of time, the Hawks went on a 17-3 run. But what is worse is Amare Stoudemire’s defense, the Hawks second unit big men, Gustavo Ayon and Mike Scott combined for ten of the 17 points during this run, with them leaking out on the fast break, or cutting to the basket, beating Amare every time. Without Tyson Chandler to clean up others teammates mess on defense, the Knicks had no interior defense. With the game getting out of hand Carmelo Anthony checked back into the game with 8:01 left in the second quarter. Anthony kept the Knicks close, being responsible for 11 of the 21 Knicks’ second quarter points, scoring 8 points and collecting an assist on a JR Smith three. This was Smith’s only made basket in the second quarter, going 1/7 in the period. JR Smith had another bad shooting night, finishing the game with only seven points, going 3/18, including 1/9 from beyond the arc. Maybe it is time to take some shots inside the three point line, and attack the paint. The Hawks lead 54-47 at the half. The Hawks pushed the lead back up to double figures behind the efforts of Kyle Korver. Raymond Felton inexplicably kept losing the Hawk’s sharpshooter, allowing him to score on back to back possessions. Losing him for a wide open three, and then flying by off a Korver pump fake, and allowing him to bank a shot in with 7:45 left in the third quarter, Hawks lead 65-54. Iman Shumpert tried to keep the Knicks in the game connecting on consecutive three pointers, cutting the Hawks’ lead to 74-69, with a little over two minutes left in the third quarter. Mike Scott killed any Knicks momentum going into the fourth quarter, when he hit a buzzer beater to end the third quarter, pushing the Hawks’ lead back up to 80-69. 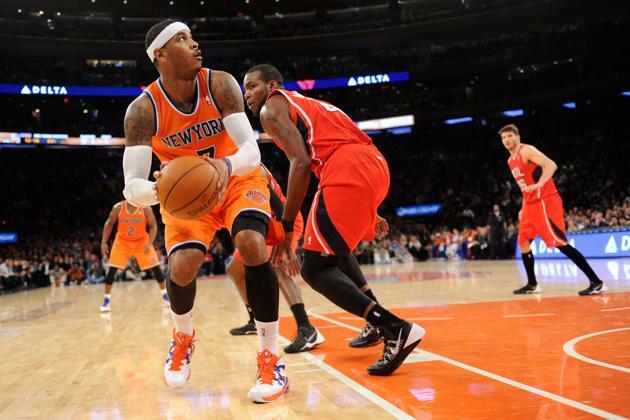 The Hawks and Knicks traded baskets throughout the fourth quarter, Knicks could not manage to cut into the deficit. Midway through the quarter Kyle Korver delivered a back breaking four point play, pushing the Hawks’ lead to 94-81. The Knicks could not recover from this point on, as the Hawks lead by as many as 22 points. The Hawks bench completely outplayed the Knicks bench tonight, finishing the game with 43 combined points, compared to the Knicks 26. Carmelo Anthony will need a lot more help, if the Knicks are planning to make any noise this year. Notes: The Knicks wore their orange jersey, while the Hawks wore their red jerseys, with both teams wearing bright colors, it was confusing at times. It reminded me of when people want to extra annoying on 2K, and wears the home white uniform, even though they are the away team. Very confusing…….